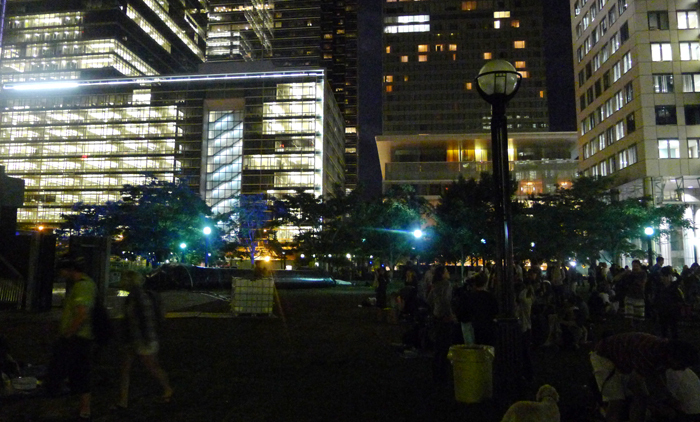 TIFF in the Park gets bigger and bigger every summer, yet it still feels cosy, surrounded by glowing towers, trees and the night sky. 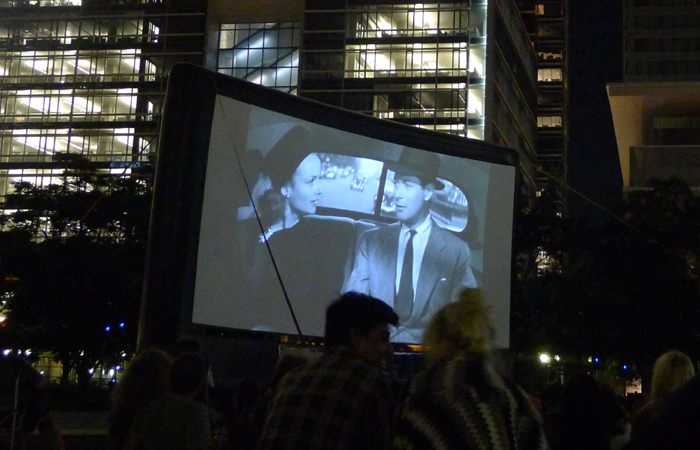 OK, so summer’s half over and I’m only posting about this year’s TIFF in the Park screwball comedy-themed lineup now. But I’ve missed all the July classics thanks to my lovely camping adventures in northern Ontario (hello, Algonquin Park! ), so I only got my first taste of this summer’s superpopular lineup last night. 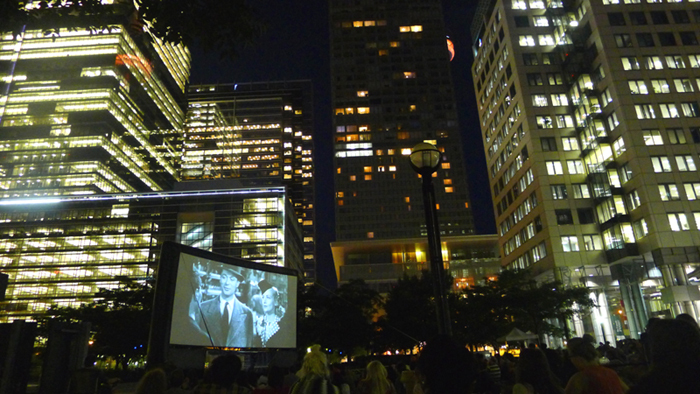 And was I ever surprised to discover David Pecaut Square – the go-to green space for free outdoor entertainment, including my famous IDD flashmob – totally packed with movie lovers and freebie fanatics alike. “Is that cannon fire or is that my heart pounding?” Casablanca. 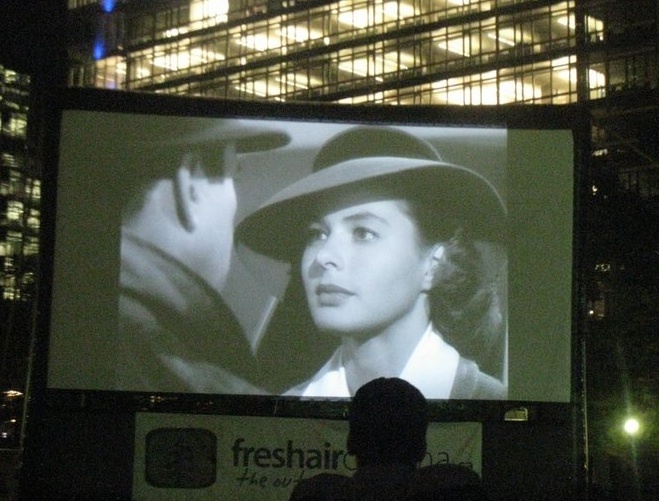 From TIFF in the Park’s first summer screenings, in 2010. Since TIFF started curating its outdoor summer selection last year (I still can’t figure out what the first year’s theme was), TIFF in the Park has been attracting more and more attendees. Last summer, with wonderful, colourful classic movie musicals, like Umbrellas of Cherbourg (see photo below), Mary Poppins, Singing in the Rain, Fiddler on the Roof, Funny Girl and The Sound of Music (my ultimate Christmas movie fave), it became increasingly difficult to find a prime spot – middle centre – if you didn’t get there by 8 p.m.! Apparently, Toronto, movie musicals aren’t just for geeks like me! The Umbrellas of Cherbourg (Les Parapluies de Cherbourg, 1964), a candy-colour French opera with the lovely Catherine Deneuve, kicked off last summer’s series of classic movie musicals at TIFF in the Park. And as I witnessed last night, Torontonians love their black-and-white screwball comedies as much as they relish their classic movie musicals! Who knew? Like last year, if you don’t get there well in advance of the start time (generally it’s 9 p.m., but by mid-August, it’s 8:30 p.m.), you’ll have to squeeze into the sidelines, with nary a green patch free. Be warned: Film fans start staking out their spot a good hour before the screening, spreading out blankets, freeing themselves of sandals and gathering with friends for a pre-film picnic. Some even bring their dogs! If you don’t stake out the right spot, you could end up watching TIFF’s classic screwball comedies in the sidelines, with the backs of heads and an anchor line blocking your view. As if to acknowledge just how popular TIFF in the Park has become, this year TIFF even has concession stand volunteers walking around the park! There’s one in the photo below, offering popcorn for sale as last night’s film, Hitchcock’s Mr. and Mrs. Smith, begins – for those last-minute munchies, natch. You can also visit the concession stand at the far end of the park till about 30 minutes into the film, or you can dash over to any number of nearby restos, cafes, or the always-a-long-lineup Tim Hortons at the corner of John and King. A popcorn volunteer (far left) walks around offering his wares just as the original Mr. and Mrs. Smith (Hitchcock’s 1941 classic comedy) starts, at last night’s TIFF in the Park. 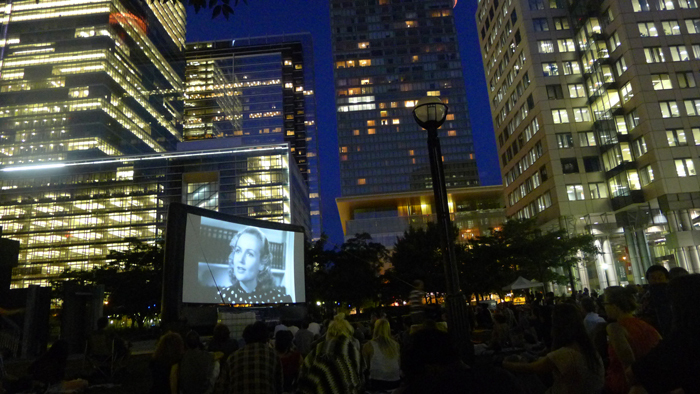 I’ve raved about Toronto’s boom of outdoor cinemas before, from the Toronto Port Authority’s Sail-In Cinema (here and here) and the Open Roof Festival to Harbourfront Free Flicks and TIFF in the Park, among others, and Fresh Air Cinema has been part of many of those screenings. The company’s inflatable screens – a double-sided one is used for the Sail-In Cinema! – are quick to set up and quick to tear down. As soon as the film ended last night, the screen deflated in seconds and the magic of TIFF in the Park seemingly went with it. BEFORE: Crowds are sprawled across David Pecaut Square, watching Alfred Hitchcock’s Mr. and Mrs. Smith in the heart of Toronto’s entertainment district, enthralled by the magic of TIFF in the Park. AFTER: As soon as the film ends, the TIFF in the Park crowd scatters and the outdoor screen, supplied by Fresh Air Cinema, deflates in seconds. So, cinephiles, you still have four more weeks of free films to watch at my favourite outdoor cinema! I’m sure the finalé, Frank Capra’s It Happened One Night (1934), with Clark Gable and Claudette Colbert, will draw the largest crowd of the summer. Be sure to get there early! What: TIFF in the Park, the FREE outdoor summer film series presented by TIFF (Toronto International Film Festival) and the Entertainment District BIA. This summer’s theme is classic screwball comedies. Where: TIFF in the Park takes place in David Pecaut Square, the lovely parkette nestled between Roy Thomson Hall and Metro Hall, near King and John. When: Every Wednesday night all summer long. Start times vary (see below). Schedule: There are still four more films screening this summer! 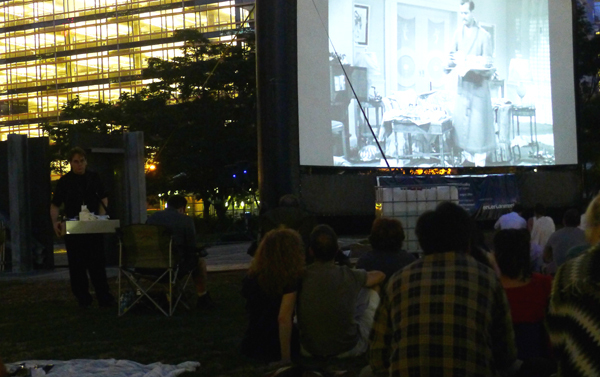 Why: Who doesn’t enjoy spending a lovely balmy night under the stars, watching classic screwball comedies?